The day is almost upon us in which we will head out with our kids for some Halloween fun! If your neighborhood is anything like ours, your kids will return home with arm loads of Halloween candy. The small pieces of candy we got as children have been replaced by full size bars these days! Most certainly the kids will already be a little sugared up as they eat some of their candy while trick or treating, and will be wanting to tear into more candy the second they get home. Like many parents, we are faced with the question of what to do with all the candy. No one likes being Scrooge on Halloween, but let’s face it: our kids are given opportunities to eat candy all the time, not just Halloween. So if there are some ways to maybe lessen the candy load, I’m all in. Many area dentists sponsor a candy buy back during the days after Halloween. Some dentists allow kids to bring in their candy and have it weighed. Based on the weight, usually per pound, the kids receive money back for the exchange. This is a great opportunity for the entrepreneurial child to earn a few dollars. Maybe a trip to the dollar store after the exchange would be an extra motivation to turn in the candy! Similar to the buy back program mentioned above, some businesses collect candy donations to send to U.S. troops. Often times, the business will give a coupon for their store in exchange for the candy. What a great way to encourage kids to think of others! To find a business in your area that participates in the program, check here. This is one of my favorite ideas and I really wish I would have started this when the kids were little! Children leave their candy on the front porch and the Switch Witch comes in the night to take the candy and leaves a gift! There is a cute storybook and doll set available to encourage this tradition. As the kids get older, it is harder to have candy magically disappear. They are sorting and counting every piece, so I can’t exactly hide a bucket full of candy! But I have come to the realization that it is sometimes easier to let them enjoy the fun on the night of Halloween and have enough candy that their bellies can tolerate. siblings. Why deprive them of this night? Sometimes the luster of candy wears off once the kids get a chance to indulge. I’ve found that the kids stop asking about the candy after a few days. I usually throw in a piece a couple days of the week in their lunches and that satisfies their candy needs for the day! In years past, we’ve made a fun recipe using leftover Halloween candy. Make a big batch of your favorite brownies or cookies and throw in some chopped up pieces. It’s a great way to use up a lot of candy! Another idea is to save some candy to bring to the movies. I usually throw a piece or two in my purse so we don’t end up buying the HUGE boxes of candy available at the theater. If all else fails, take one for the team and eat the candy for the kids! It’s just for safety purposes, right?! Maybe your kids will be generous enough to share their candy with you. This helps to lighten their load! Halloween is a fun and memorable childhood tradition! 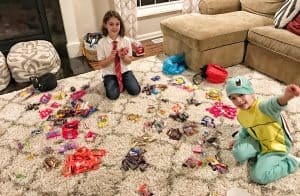 I don’t deny my kids this fun, but as a mom, I make sure to not let the kids go too crazy with the candy — or else we all pay the price with belly aches and sugar crashes! Jaclyn Musselman lives in Rocky River, Ohio. She is a mom of three and has been married to her college sweetheart for 15 years. She blogs about family activities and traditions, home decor and favorite finds at www.coffeepancakesanddreams.com.